084. SCOTT AUF DEM WEGE ZUM SÜDPOL. Issued by Echte Wagner Margarine. (Date?). No. 6 from a set of unknown number. Size: Ca. 3.9" x 2.75". 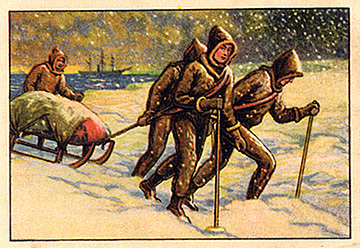 Recto: Four men manhauling a sledge with ship in background.